One of my favorite holiday meals is a good dressing side recipe. 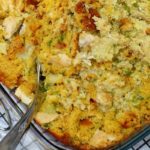 This chicken and dressing recipe can be used with turkey, but when a turkey is the main stable at the table, I like to change things up with a different bird. 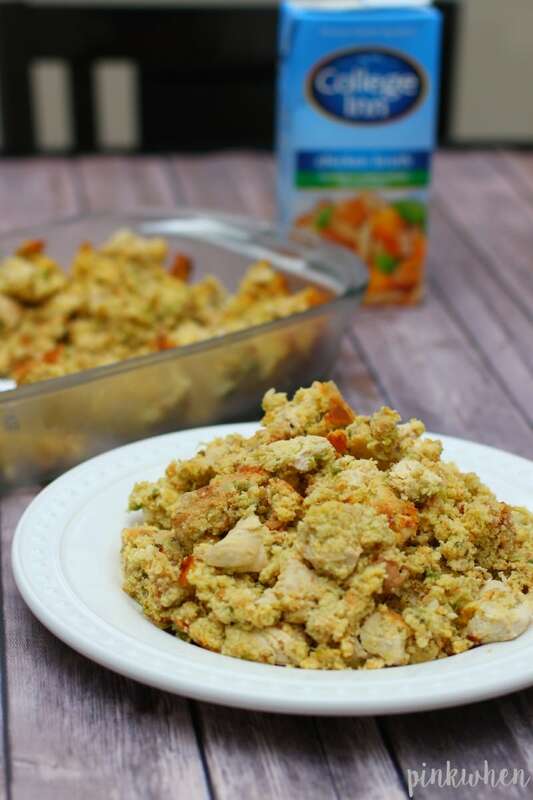 This chicken and dressing recipe is a family favorite at our house, and everyone likes to go back for seconds and thirds. Made with a delicious Mexican cornbread, you will want to make this dish over and over again for almost any occasion. The best part is that it is easy. I love this chicken and dressing recipe, and I hope you will soon enjoy it too. 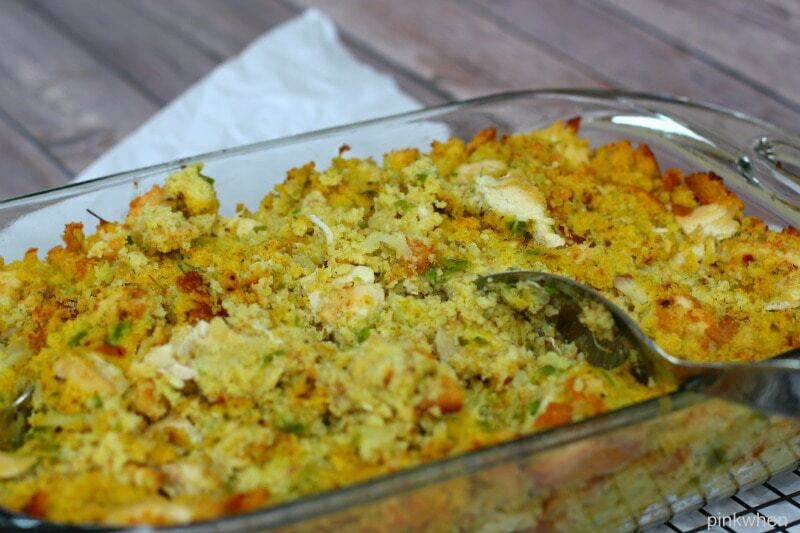 It’s one of those recipes that is a perfect holiday side dish or made as a meal. We were tasked to make this recipe for College Inn products, and man was it a good one. Mix all three packages of cornbread mix as directed and bake in a large iron skillet. Allow to cool and then crumble into a large mixing bowl. Add white bread pieces and mix with cornbread. Saute onion, celery, and bell pepper with butter in a skillet. Stir in pepper, salt, and oregano. Cook until vegetables are tender. Add vegetable mixture in cornbread and add in cream of chicken soup. Stir in 1/4 cup College Inn Chicken Broth (and keep adding in small increments of chicken broth) until dressing is moist to your liking. Allow mixture to sit for a few minutes to see how much the dressing soaks up the broth and add more if needed. 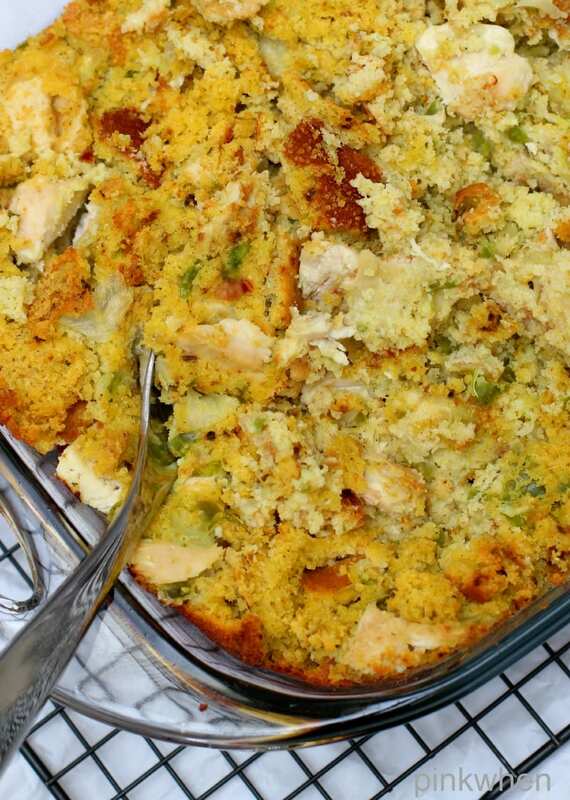 Once the stuffing is moist to your liking, add in the cooked and cubed chicken. Heat oven to 400. 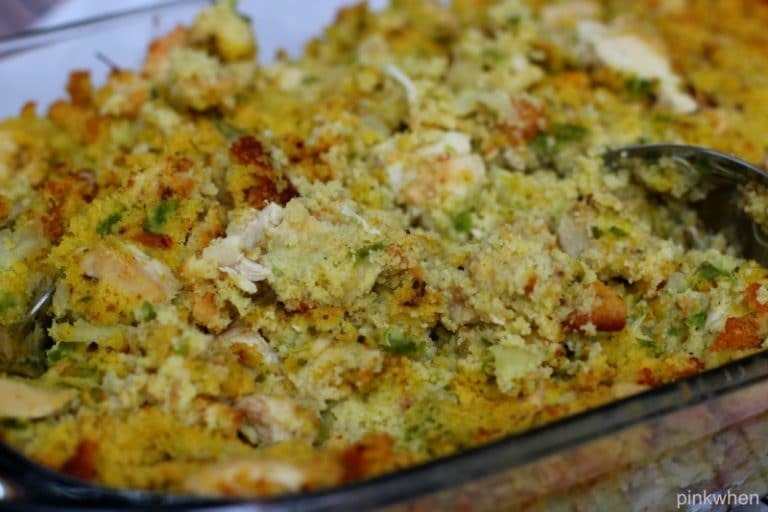 Pour dressing into the desired baking dish and then and bake stuffing until lightly browned on top. 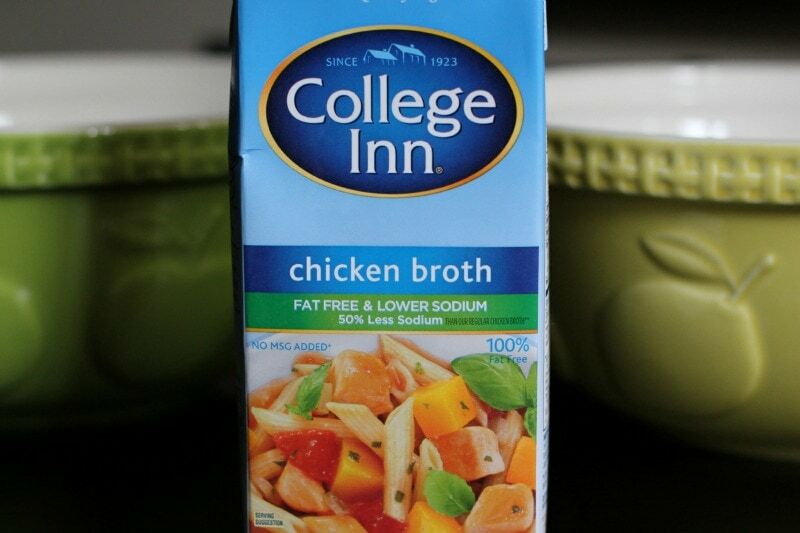 If you want to serve with turkey, substitute turkey for the chicken and substitute the College Inn Chicken Broth for College Inn Turkey Broth. A delicious holiday side dish, or a perfect weeknight meal. Mix all 3 packages of cornbread mix as directed and bake in a large iron skillet. Allow to cool and then crumble into a large mixing bowl. Add white bread pieces and mix with cornbread. Add vegetable mixture in cornbread and add in cream of chicken soup. Stir in 1/4 cup College Inn Chicken Broth (and keep adding in small increments of chicken broth) until dressing is moist to your liking. Allow mixture to sit for a few minutes to see how much the dressing soaks up the broth and add more if needed. Once the dressing is moist to your liking, add in the cooked and cubed chicken. Heat oven to 400. Pour dressing into desired baking dish and then and bake dressing until lightly browned on top. If you want to serve with turkey, just substitute turkey for the chicken and substitute the College Inn Chicken Broth for College Inn Turkey Broth. What are your favorite holiday side dishes? Do you use the same holiday recipes every year, or do you change things up?